The Concurrent Versions System (CVS) is a Change Management (CM) system for software source code control to store and keep track of development changes. CVS is primarily used as a source code control system for text files. Programmers will generate revisions to individual source code files. A collection of these files may define a specific software release. CVS aims to manage the collection of these files and the respective revisions of the individual files that make up the collection. CVS is a command driven file checkout, update, compare and management system. Front end web and desktop GUI systems are available to ease the use of CVS. CVSROOT: Location of CV source code repository. CVS commands are used with directives and command line options to create a repository, check-out, check-in and update code and interrogate changes between versions. Typically one will use a CVS repository which has already been generated, if not, one must be generated and populated with source code text files. -d: Directory used for repository. Note that an absolute pathname must be used. [Potential Pitfall]: This is the CM repository and not a developer working area. No work, editing of files or changes should be made directly to this directory. The repository is loaded using the "import" command and files checked out to the users local working directory using cvs commands. Files are edited in the user's local working directory. Files are checked-in to synchronize and update the repository using cvs commands. Files are added and deleted using cvs commands. All interactions with the repository are done with cvs commands. Check in all files and directories from within the current working directory. The directory referenced is the tree structure for CVS not your current path. Now that it has been checked into the repository you can save,back-up or remove the current working directory. All future work will take place by checking out code from the repository. This check-out code will be under CVS CM control. The directory you just imported is not under CVS control. The files and directories in $HOME/src/ProgABCWorkingDir were just checked into a repository named ProgABC. All exports and checkouts will start with the directory name ProgABC (not ProgABCWorkingDir). Use the same name for both if that is your intent. [Potential Pitfall]: The directory you are importing can not be in the same directory as $CVSROOT. An endless recursive loop will take place as it will try and check-in the repository itself. This is to get a copy of the sources and directories with the intent that the files will not be altered but shipped off site. Code extracted from CVS with export cannot be checked-in because export does not create any administrative entries. Start is the name of the first entry into CVS. See import. The directory ProgABC is generated with the contents of the export placed in that directory. By default CVS will apply recursively through sub-directories. Use the option flag "-l" to prevent this. The option "-R" explicitly defines the recursive behavior. -d cvs_root_directory Use cvs_root_directory as the directory pathname of the repository. Overrides the $CVSROOT environment variable. -e editor-command Use the editor command specified for entering log information. Overrides $CVSEDITOR and $EDI‐ TOR environment variables. -f Do not read the ~/.cvsrc file. -n Do not make any changes to the root repository. Print out what would happen if the "-n" flag was not used. -Q Quiet mode. Less verbose than normal. -q Marginally quiet mode. Reports of recursion are suppressed. -w Make new working files read-write. Overrides the setting of the $CVSREAD environment variable. admin CVS interface to assorted administrative facilities. annotate Shows the revision modified each line of a file. export Export sources from CVS. The files exported are NOT under CVS control. Note that files which are checked out are under CVS control. Use export to deliver or publich code. import Import sources into CVS. Used for initial checkin of code into the CVS root repository. ls Used to list files and directories in the local working directory. Repository required. rls Used to list files and directories in the repository. rdiff Generate "patch" format diffs between releases. release Indicate that a Module is no longer in use. Cancels the effect of cvs checkout. In this case, module "ProgABC" is a directory which will be created in your current directory with all the appropriate sub-directories and files. The files/directories to checkout can be referred to by module name or relative path name from $CVSROOT. This will checkout the files necessary for the previous build for Rel-1A. The release or "tag" name in this example is "Rel-1A". This pulls out a single file for editing without getting the whole project. Note that all directories will contain a sub-directory named CVS/. This is for CVS CM management and should never be altered. -D date Use the most recent revision no later than date. This option implies -P.
-l Local; run only in current working directory. -n Do not execute CVS command, just show what would be done if the flag "-n" was not used. -P Prune (remove) empty directories in user working directory. -R Default behavior. Checkout directories recursively. -r tag[:date] Checkout the revision specified by tag or, when date is specified and tag is a branch tag, the version from the branch tag as it existed on date. This option implies -P.
-d directory Create a directory called dir for the working files, instead of using the module name. -c Copy the module file, sorted, to the standard output, instead of creating or modifying any files or directories in your working directory. -s Like -c, but include the status of all modules, and sort it by the status string. When working with a team of software developers, it is wise to periodically update your local working code to benefit from the changes and bug fixes contributed by other members of the team. This command updates the files and directories in the current directory and recursively through all sub-directories. An update without the option "-Pd" will not add or delete directories in the local working directory when synchronizing with the root repository. This command will show you the updates it is planning on making without performing the actual update. Your local files changed are also shown. 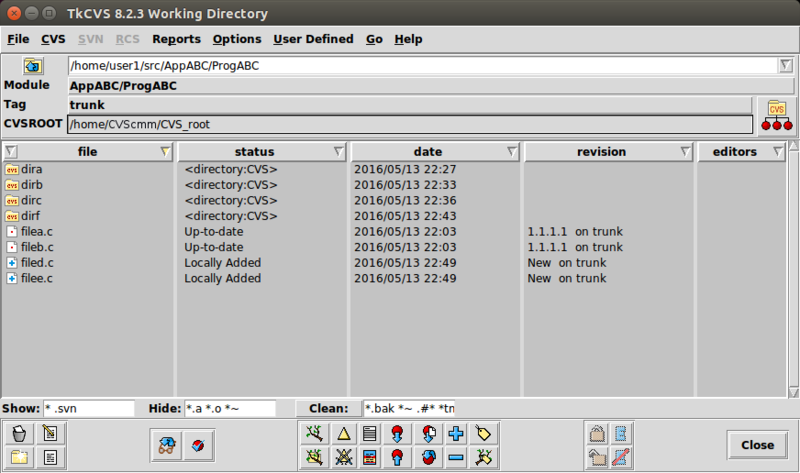 -P Prune (delete/remove) all directories deleted in the root repository. -d Add any directory to your local working directory which has been added to the root repository. -D date Use the most recent revision no later than date. -f Only useful with the -D or -r flags. If no matching revision is found, retrieve the most recent revision. -R Default behavior. Update directories recursively. -r tag[:date] Retrieve the revisions specified by tag or, when date is specified and tag is a branch tag, the version from the branch tag as it existed on date. -C Overwrite locally modified files with clean copies from the repository (the modified file is saved in .#file.revision). -I name Ignore files whose names match name (in your working directory) during the update. More than one "-I" can be specified. you perform an update - CVS shows that a conflict has occured! The same lines is a file have been altered by two people and CVS does not know how to update that file. The cvs update will list all of the files recursively and list them prefixed with a single letter: M (modified), U (updated), A (added), C (conflict), etc. All files marked with a "C" are files with conflicts which require user resolution. Edit all files with conflicts. Updates are marked in the file and you are obligated to edit the file and resolve the conflict or conflicts if multiple. The conflicting lines will be in the updated file. The changes of both people are marked in the file delimited by <<<<<<<, ======== and >>>>>>>. Be sure to remove the <<<<<<<, ======== and >>>>>>> lines and alter the file so that it reflects your desires. Once the conflict has been resolved, the file will be ready to be checked in. Status of checked out working repository. Option "-v": Print tag information. All modifications in your local working directory will be shown with the prefix "M". Lists all files recursively from your current directory. While this is the "update" command, the command options "-qn" prevent an actual update. M: modified files in the local working directory. Use "cvs diff filename" to see your modifications. C: conflict with repository. Modifications in your file "collide" with changes made and checked into the repository. This means that someone modified the same lines of code and CVS does not know how to merge your file with that in the repository because it does not know who is correct. U: file updates have been made to the repository. P: Like U, but the cvs server sends a patch instead of an entire file. A: The file has been added to your private copy of the sources. -l Show last modification only. -D date Show data since date. -c Report on each time the repository was modified. -e Everything (all record types). -m module Report on a particular module. -T Report on all tags. -o Report on checked-out modules (default behavior). -a Show data for all users. -w Show only the records for modifications done from the same working directory where history is executing. -f file Show data for a particular file. Multiple files can be specified on the command line. -r rev Show records referring to revisions since the revision or tag named rev. -t tag Show records since tag tag was last added. -u user-name Show records for user user-name. Check in files from within the directory. i.e. file.c must be in your current working directory. Multiple files or directories can be checked in on the same command line. This is preferred if the files are all part of the same change set. The flag -d will delete all of your working sub-directories. CVS will let you know if files have changed and prompt you for a [y/n] reply. Note that the cvs directives "ci" and "commit" are the same and perform the exact same function. -c Refuse to commit files unless the user has registered a valid edit on the file via cvs edit. -F file Read the log message from file, instead of invoking an editor. -m "log message goes here" Use message as the log message, instead of invoking an editor. -f Force cvs to commit a new revision even if you haven't made any changes to the file. Causes the -c and -R (default) options are ignored. Note that if you specified a CVSEDITOR environment variable and no commit comments are added, the editor specified will pop-up for each and every directory to allow you to enter a check-in comment. CVS will get its commit/check-in comments. The additions/deletions only fully take place after a check-in (commit) of the repository is performed. The module "ProgABC" is a short name for "$CVSROOT/ProgABC"
Web cgi script cvsmodules to list all modules available for check-out. Tag a revision such that the current build is known to be made up of particular releases of various files. Where Rel-1A is the tag name for the build of module "ProgABC"
Tag a repository (directory/module) to add the symbolic name to the "snapshot" of the current sources. Tag the repository before check-in. If bug fixes are added afterwards, only those files which have been changed need be re-tagged. This will compare the version of the file in your working directory with that of the original you checked out. -r tag[:date] Compare with revision specified by tag or, when date is specified and tag is a branch tag, the version from the branch tag as it existed on date. -lines Show lines (an integer) lines of context. -b Ignore trailing white space. --ignore-all-space Ignore white space when comparing lines. --ignore-blank-lines Ignore changes that just insert or delete blank lines. --ignore-case Ignore changes in case; consider upper- and lower-case to be the same. --side-by-side Use the side by side output format. -w Ignore white space when comparing lines. tkdiff: [download] Comes with tkcvs CVS GUI front-end. Note: Use command "svn log file-name" to view valid revision numbers for the file. Referencing invalid revision numbers as input to tkdiff will not work. gtkdiff: Has diff3 and merge features. Written with GTK+. After gtkdiff-0.8.0, GNOME desktop required. diffUse: Diff/merge GUI tool. Good line matching features. Supports Unicode. kdiff3: Graphical directory and file diff, merge and edit. KDE3/Qt based. Supports drag and drop. Comes with S.u.S.E. distro. (Cross platform) MS/Windows download available. A very good directory and file diff and merge tool. Included in Red Hat RPM package "kdesdk" an Ubuntu package "kompare". Solution: Install the dependency package "kdebindings". mgdiff: Motif-based graphical file difference browser and merge. Comes with S.u.S.E. distro. Meld: Compare, edit and merge. xxdiff: Compare 2 or 3 files and merge. Also compares directories. This changes the behavior of a checkout and update. When performing the command "cvs update", the actual command performed will be "cvs update -P"
Note that "cvs co" and "cvs checkout" will both experience modified behavior. [Potential Pitfall]: The password will be stored in ~/.cvspass and is a potential security hole. Be vigilant! RCS Information: - man pages on rcsintro, rcs, co, ci, ident, rcsclean, rcsdiff, rcsmerge, ident, rlog, merge. TkCVS is a Tcl/Tk-based graphical front-end to CVS (and Subversion and RCS). It includes TkDiff for file diffs and merges. TkCVS is used for tagging, merging, importing, exporting, checking in/out, file query and status of CVS managed files. This RPM is available from the EPEL (Extra Packages for Enterprise Linux) website. CVS Home.org - Links and info. "Open Source Development with CVS"
ISBN #158880173X, Coriolis Open Press. The only book I know of which is totally dedicated to the topic of CVS.